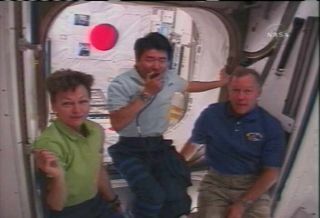 JAXA astronaut Takao Doi (center), station commander Peggy Whitson and shuttle commander Dominic Gorie speak with Japanese dignitaries from the entrance of Japan's new Kibo storage module aboard the International Space Station on March 19, 2008. HOUSTON - When visiting someone?s house - even in space -bring food. That was Japanese astronaut Takao Doi?s motto and his country?sorbital eats are apparently a hit aboard the International Space Station (ISS). Doi, a veteran spaceflyer who is helping deliver the first segmentof Japan?s massive Kibo laboratory to the ISS, packed three types of Japanesenoodles, some salmon and steamed rice for his crewmates aboard the shuttle Endeavourand space station. ?Actually, the Japanese food was great, especially after beingup here for five months,? station commander Peggy Whitson told Japanese Prime Minister YasuoFukuda late Wednesday. ?Takaowas kind enough to bring us chopsticks to make it official.? The 10 astronauts aboard the station and shuttle sat downtogether for a joint meal early Wednesday, where they sampled Doi?s Japanesetreats. ?It was particularly good to have something different,? saidWhitson, who is nearing the end of a six-month stint as the station?sExpedition 16 commander. ?It was very tasty.? Doi launched toward the ISS with six NASA astronauts aboardthe shuttle Endeavour on March 11 to deliver the space station?s JapaneseLogistics Pressurized module, a storage compartment for the Japan AerospaceExploration Agency?s (JAXA) tour bus-sized Kibo laboratory. He is also testing newJapanese space clothing, underwear and a boomerang in orbit. The astronauts also swapped out one member of the station?screw and constructed a giant, Canadian-built maintenancerobot called Dextre during three spacewalks. Doi gave Fukuda and viewers inJapan a tour of the station?s new Japanese room. ?Doi-san, thank you for your hard work,? Fukuda told theJapanese astronaut. The storage module is the first of JAXA?s three-segment Kibo(?Hope? in Japanese) lab, which is so massive it is being launched in pieces.The lab?s large, primary experiment module is set to launch in late May, with aporch-like external platform to follow next year. "Thisis a Japanese home in space and we hope to utilize this,? Doi said of Kibo. ?Wehope everybody will utilize this in the future.? NASA is broadcasting Endeavour's STS-123 mission live on NASA TV. Click here for SPACE.com'sshuttle mission coverage and NASA TV feed.